Mist laden hills, enchanting valleys, gushing streams, cascades, rolling grasslands, sprawling plantations, colonial bungalows, wildlife and many more makes Idukki, a landlocked district in Central Kerala a unique destination for travellers. The hilly terrain, which has the highest point in South India- Anaimudi offers ample scope for trekking, other adventures sports. 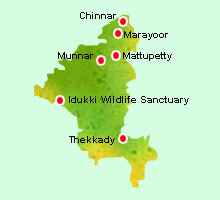 It is one of the districts in Kerala with a predominant tribal population. With the famous hill station Munnar as its crowning glory, Idukki also has numerous other places of interest that adds to the destination value of the district.